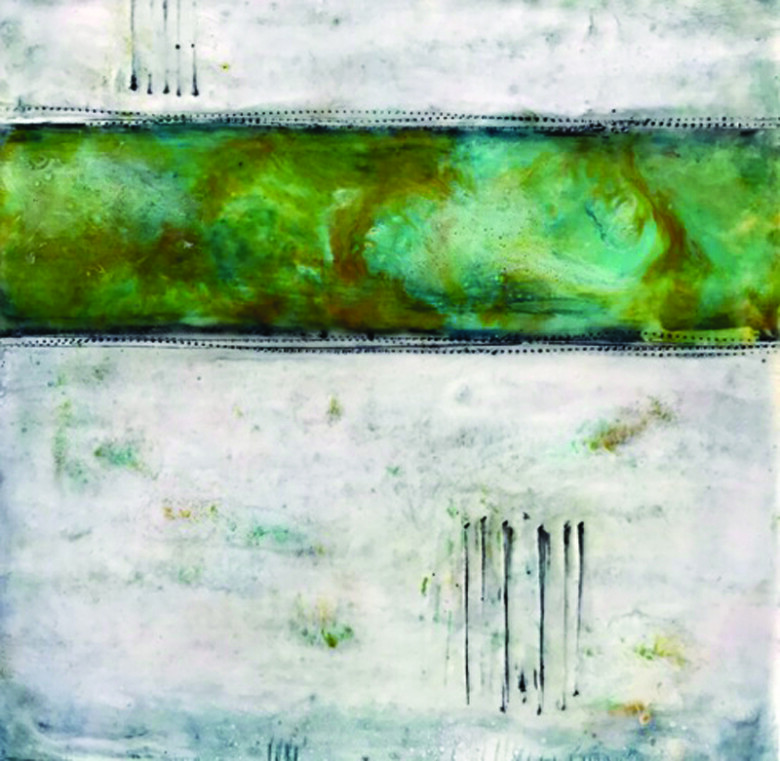 Winthrop Gallery artists Teri Pieper and Tamera Abate work in encaustic art. What, you might ask, is “encaustic” art? Encaustic is a wax-based paint composed of beeswax, damar resin, and pigment which is kept molten on a heated palette, applied to a wood surface, and then reheated to fuse the paint to the panel. The encaustic artist uses a torch or iron to manipulate the wax mixture. The extreme heat of the process makes it difficult to control the exact outcome thereby making each painting unique. 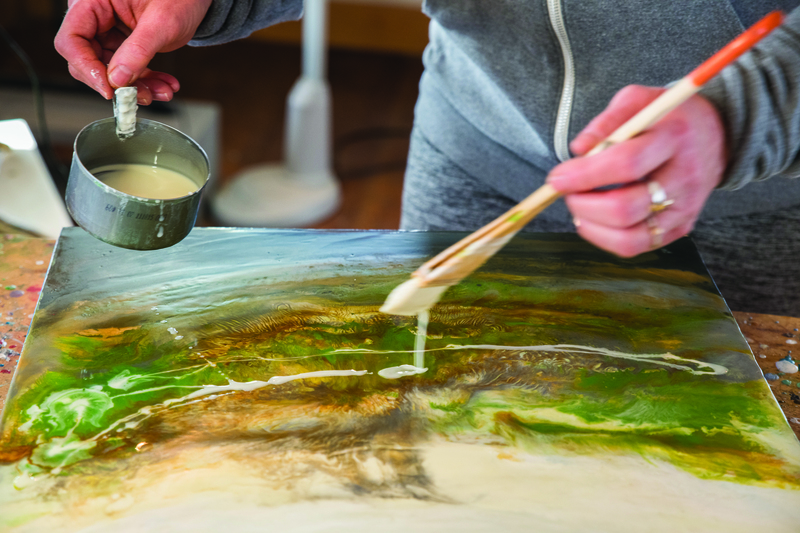 The encaustic artist can excavate through the layers with the torch or iron to reveal previous layers of color and to allow the molten wax to combine to create new colors. The result is a luminous image encased in translucent layers of wax. Still practiced by contemporary artists, including Pieper and Abate, encaustic is an ancient method of painting with examples dating from Egypt in 100-300 A.D. The word comes from the Greek word enkaustikos, meaning “burn in.” Abate stumbled onto the process when she covered one of her journal pages in wax, just to see what it looked like. Her brother asked her if she’d ever tried encaustic painting. She said, “What’s that?” He explained it to her, and she started researching and experimenting. Her work, thus far, features bands of textured colors and other abstracted images, including colorful birds. She plans to do further encaustic work depicting abstract landscapes featuring water. 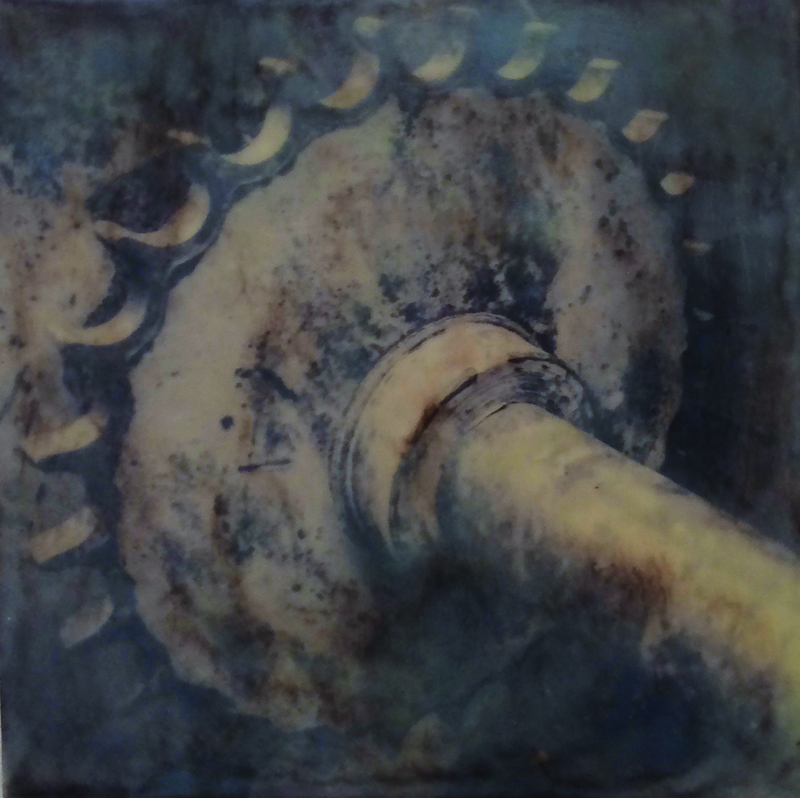 Teri Pieper uses encaustic techniques with her photographs as the base. Her current work features soft-toned and abstracted images of mechanical parts, doors, windows, and stairs. She reminds her collectors that the surface can be buffed out with a soft cloth and to not leave encaustic art in a hot car in the summertime or the wax will melt. Pieper and Abate invite those curious about encaustic art to visit the Winthrop Gallery and check out their work. The schedule for when they will be in the Gallery can be found in the Gallery window, on the Gallery web site at www.winthropgallery.com, and on the Gallery’s Facebook page. LOCATION/HOURS: The Winthrop Gallery is located at 237 Riverside in downtown Winthrop. Spring hours: 10am to 5pm, Thursday through Monday. INFO: 509-996-3925, www.winthropgallery.com.